- Your payments or contributions are made at the END of the periods. - The maximum 401k contributions per year that you are allowed to make are controlled by the IRS. For example, the maximum 401k contributions for the year 2006 are $15000. Go here to learn more about the maximum 401k contributions. The calculator is not functioned to determine whether you are over contributing money or not. - The final numbers generated are rounded off and only approximations, and should only be used as a guide. 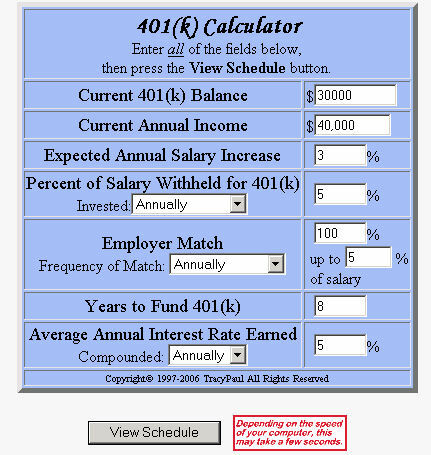 - Percent of Salary Withheld for 401k: 5% (this is the annual percentage of your salary that goes towards making 401k contributions). You can change it from monthly, quarterly, semi-annually, annually, etc. - Employer Match: 100% and 5% (this is the percentage amount that your employer contributes towards your 401k plan every year. Your employer will therefore contribute 100% of a maximum of 5% of your annual salary. You can change it from monthly, quarterly, semi-annually, annually, etc). - Years to Fund: 8 years (this is the # of years you would like your 401k retirement savings to grow). - Average Annual Interest Rate Earned: 5% (this is how much interest rate compounded annually that your contributions earn).